Few years back, planning and structural designing of complex buildings, machines etc. were done on drawing boards and paper, with various tools like pencil, eraser, compass, scale etc. With the advent of computer technology, specially with the software named CAD / CAM, these jobs have become more easier and simpler. Computer-Aided Design and Drafting (CADD), most popularly known as Computer-Aided Design (CAD) is an electronic tool which enables quick and accurate drawing with the use of computer. CAD make use of computer software programmes, special purpose hardware as well as graphics to generate drawings. CAD software is often referred to as CAD CAM software. CAM (Computer Aided Manufacturing) is a system of automatically producing finished products by using computer controlled production machines. Even though, the world's first Computer-Aided Design (CAD) software was developed in the early 1960's, CAD became popular in the beginning of 1980's. It was Ivan Sutherland who developed the first CAD software named 'sketchpad' in 1963. But before that in the year 1957, Dr. Patrick J. Hanratty had developed a commercial CAM software system, a numerical control programming tool called 'PRONTO' and for that reason Dr. Hanratty is referred as 'the father of CAD CAM'. Creativity, science and business are combined in the CAD field which are used to design curves and figures in two dimensional (2D) space; or curves, surfaces or solids in three dimensional (3D) objects. In addition to the software, CAD systems require a high quality graphics monitor and graphics card, a mouse, light pen or digitizing tablet for drawing, and a special printer or plotter for printing design specifications, as well as high speed CPU's and large amounts of memory (RAM). Computer aided design involves creating computer models defined by geometrical parameters that appears on a computer monitor as a three-dimensional representation which can be readily altered by changing relevant parameters. This neat, clean and highly presentable CAD drawing have a number of advantages over drawings created on a drawing board. These electronic drawings can be modified quite easily; presented in a variety of formats and the existing components of the drawing can be rearranged to fit the new shape. CAD systems also allow to view a design from any angle with the push of a button and to zoom in or out for close-ups and long-distance views. With proper shading and rendering, the models made by CAD can be made to look exactly like pictures. Earlier Computer Aided Design software's were used merely by engineers especially architectural engineers and mechanical engineers. With the passage of time, CAD has made its access in all fields where creativity and designing is required. It is widely used for product design in automotive, shipbuilding and aerospace industries, prosthetics (artificial device for replacing missing body part), industrial and architectural design, and even to produce computer animation in movies, advertisements etc. 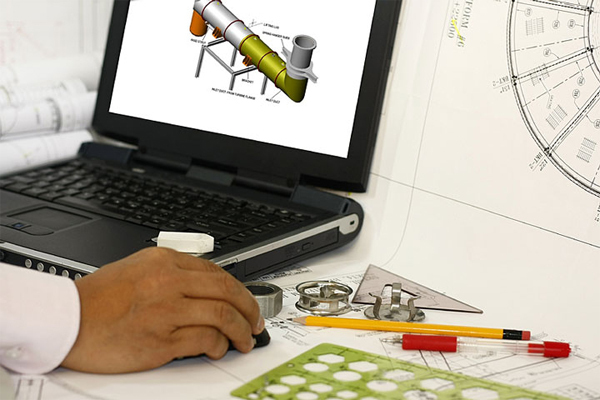 As a result, many new career avenues has been opened in the field of CAD. Now-a-days this technology is used not only by engineers and architects in their design process, but also other design professionals as well. The applications of CAD software are mostly allied with engineering fields like architecture, civil, mechanical, automobile, electrical, interior design and related firms. All these fields involves lot of designing and most of the professionals and companies do their designing and drawing with the CAD software. CAD system enable an engineer / designer to develop and convey their ideas on screen, take a print out or save it for future editing and thus save a lot of valuable time on their drawings. It facilitates lower design costs and a shorter design time. Engineers and designers use CAD software program in a wide variety of industries to design and manufacture physical products ranging from buildings, bridges, roads, aircraft, ships and cars to digital cameras, mobile phones, televisions etc. Skilled personals with outstanding drawing skills and computer knowledge can excel in the field of Computer Aided Design. Professionals working in computer aided designing jobs are usually called CAD operators or Drafters. The major tasks performed by these professionals are evaluating, preparing and producing drawings, and designing layout and sketches using computers.